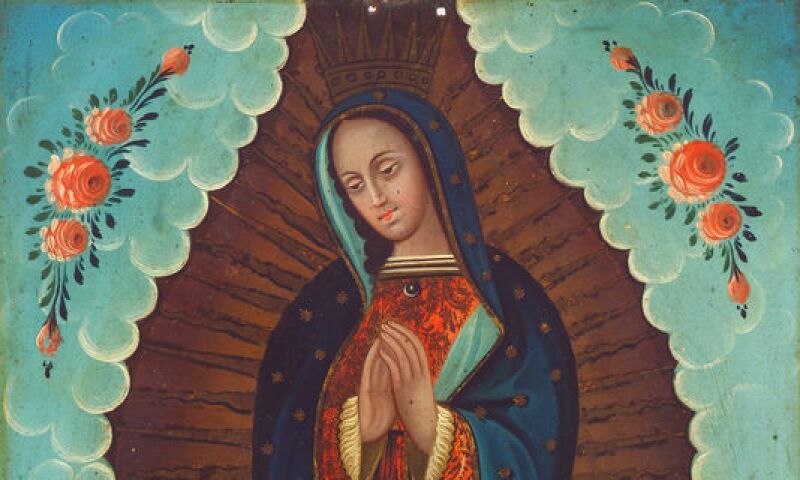 Anonymous, Our Lady of Guadalupe, late 19th century, oil on tin. EPMA, gift of Dr. Steven McKnight in honor of Frank and Sara McKnight. Retablos, or small devotional paintings on tin and copper, were part of everyday life in 19th and 20th century Mexico. They were displayed at major pilgrimage sites throughout the country, and in homes and churches. This March, EPMA’s retablos collection—the second-largest in the United States—is being highlighted in a new installation featuring the museum’s key collections gifted by El Paso’s Hamilton, McKnight, and Roderick families. The exhibition, representative of the breadth and depth of EPMA’s holdings, focuses on the Virgin Mary in her many folk and formal manifestations. It includes ex-votos, or paintings commissioned to commemorate miracles, and retablos santos, or paintings of saints and holy figures. Joy and Suffering illuminates not only the devotional culture of 19th and 20th century Mexico, but also the daily joys and sufferings of life.